Had a great weekend. Planted rhubarb, saw a matinee of “Before Midnight” which was painfully beautiful. Walked around the LARAC art fair. Ate good food. Busy but without agenda, so it was relaxing. My girlfriend is going away on Wednesday for six days, so I plan to work uninterrupted from the moment I wake up til the moment I collapse, on each of those days. Hopefully I can get a little caught up. I’m mentally preparing. Wish me luck. Hey, you said this is why you disintegrated Emily’s love right? So a medibot couldn’t patch him up? The additional strip, how long before the ditherkers run out of power/starve, whatever? Pottybot has his $#!+ together. Don’t you think the ditherkers will die from eating putrid Qwahntoo pate? Glad you liked Before Midnight. I did too, but man, it sure was hard to watch at times. And nice to see that the bad guy got his up there in panel 5. Hmm, as long as he hasn’t been disintegrated Qwantoo’s still in the game. And I wouldn’t put it past him to survive that. You don’t live to thousands of years, become an inter-dimensional criminal and found a galactic empire without a few tricks up your sleeve. Yuri is way too dangerous to piss off. Too bad there isn’t a giant glowing sign floating above her to give warning. @Andrew, dude, Qwahntoo’s rib cage analog is exposed almost down to his backbone analog. There’s no sign of his internal organs (that’s why you have rib cages — to protect sensitive organs) and no indication that his neurological functions (his brain) were distributed throughout his body. There’s always the chance that he’s got some really bitchin’ nanites, but hey, those all got dumped on the ground and down the gullet when his major vessels were severed. So even if the nanites were able to preserve brain function, even they can’t work without fuel. They’ll have no raw materials available to regenerate tissue, and even if they could, the new tissue would be consumed by the ditherkers as soon as it’s grown. But he certainly has a clone in cold storage back on his ship. Who would run the universe without a backup? @Tom_M, crap! I never finished that. Um. Okay. On the list to do today. That strips a few weeks back, now colored/updated! @Joe, and don’t forget the Ites that Qwahntoo killed just after planetfall. They’re tasty when they’re furry, how much better are they when they’re clean-shaven? Lookit Pottybot, pulling out the creds. Oh wow! 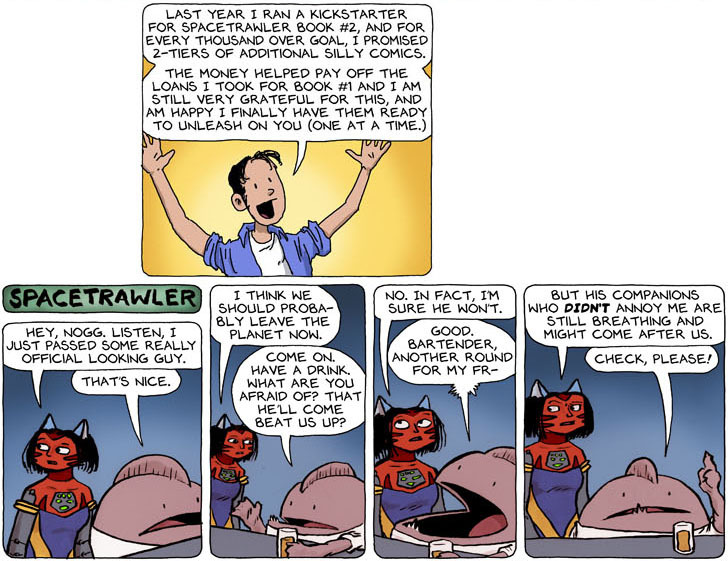 I just found this Spacetrawler strip FROM THE FUTURE!!! !